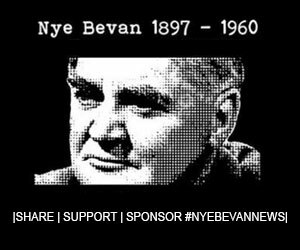 Home Opinion Follower Opinion Why did the Labour Party expel Nye Bevan? Before the War, in the 1930s, The Labour Party got smashed down to 50 or so MPs, having been seen to have abandoned their core voters. They were accused of selling the working classes out to the banking & political establishment in the aftermath of the Great Depression. By March 1938 Bevan was writing in Tribune that Churchill’s warnings about German intentions for Czechoslovakia were “a diapason of majestic harmony” compared to Prime Minister Neville Chamberlain’s “thin, listless trickle”. Bevan called for a Popular Front against fascism under the leadership of the Labour Party, including even anti-fascist Tories. On 31 March 1939 Bevan was expelled from the Labour Party along with a handful of others for sharing platforms with organisations not affiliated to Labour in his pursuit of a Popular Front. There was crushing economic devastation during the war, but after the War Labour still managed to build the welfare state and National Health Service thanks to people like Aneurin Bevan – the man they expelled for opposing fascism. Has much changed today in the Labour Party? “I got wrongly expelled from the party last year because I dared to raise money to help people pay their bills during the leadership election. Many people couldn’t afford to eat that week because of the £25 poll tax they slapped on it. That’s more than half a week’s worth of benefits. Labour is supposed to be the party for the working class. What’s wrong with wanting to take it back to it’s core values? Nye Bevan was expelled from the party too in 1939. By 1948 he had founded the NHS.